By Rex Dickens or the NAMI Sibling and Adult Children Network. I am fortunate to have a loving and supporting family that helps me deal with and cope with my serious mental illness. I consider myself extremely fortunate. I feel that some of my family, mainly those quite empathetic or some with lived experience are best suited for me to Feel that they are being supportive. 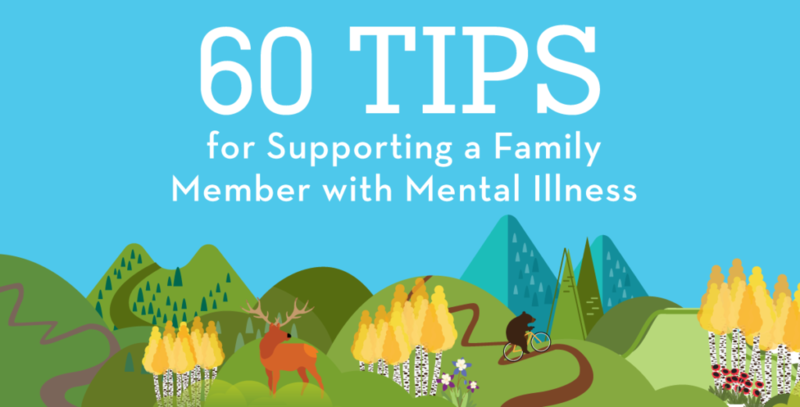 I do not mean that others in my family are not supportive nor that they do not know how to communicate their support – just perhaps that I cannot relate to them. You cannot cure a mental disorder for a family member. Despite your efforts, symptoms may get worse, or may improve. If you feel much resentment, you are giving too much. It is as hard for the individual to accept the disorder as it is for other family members. Acceptance of the disorder by all concerned may be helpful, but not necessary. A delusion will not go away by reasoning and therefore needs no discussion. You may learn something about yourself as you learn about a family member’s mental disorder. Separate the person from the disorder. Love the person, even if you hate the disorder. Separate medication side effects from the disorder/person. It is not OK for you to be neglected. You have needs & wants too. Your chances of getting mental illness as a sibling or adult child of someone with NBD are 10-14%. If you are older than 30, they are negligible for schizophrenia. Your children’s chances are approximately 2-4%, compared to the general population of 1%. The illness of a family member is nothing to be ashamed of. Reality is that you may encounter discrimination from an apprehensive public. Don’t forget your sense of humor. It may be necessary to renegotiate your emotional relationship. It may be necessary to revise your expectations. Success for each individual may be different. Acknowledge the remarkable courage your family member may show dealing with a mental disorder. Your family member is entitled to his own life journey, as you are. Survival-oriented response is often to shut down your emotional life. Resist this. Inability to talk about feelings may leave you stuck or frozen. The family relationships may be in disarray in the confusion around the mental disorder. Generally, those closest in sibling order and gender become emotionally enmeshed, while those further out become estranged. Grief issues for siblings are about what you had and lost. For adult children the issues are about what you never had. After denial, sadness, and anger comes acceptance. The addition of understanding yields compassion. The mental illnesses, like other diseases, are a part of the varied fabric of life. Shed neurotic suffering and embrace real suffering. The mental illnesses are not on a continuum with mental health. Mental illness is a biological brain disease. It is absurd to believe you may correct a physical illness such as diabetes, the schizophrenias, or manic-depression with talk, although addressing social complications may be helpful. Symptoms may change over time while the underlying disorder remains. The disorder may be periodic, with times of improvement and deterioration, independent of your hopes or actions. You should request the diagnosis and its explanation from professionals. Schizophrenia may be a class of disorders rather than a single disorder. Identical diagnoses does not mean identical causes, courses, or symptoms. Strange behavior is symptom of the disorder. Don’t take it personally. You have a right to assure your personal safety. Don’t shoulder the whole responsibility for your mentally disordered relative. You are not a paid professional caseworker. Work with them about your concerns. Maintain your role as the sibling, child, or parent of the individual. Don’t change your role. Mental health professionals, family members, & the disordered all have ups and downs when dealing with a mental disorder. Forgive yourself and others for mistakes made. Mental health professionals have varied degrees of competence. If you can’t care for yourself, you can’t care for another. You may eventually forgive your member for having MI. The needs of the ill person do not necessarily always come first. It is important to have boundaries and set clear limits. Most modern researchers favor a genetic, biochemical (perhaps interuteral), or viral basis. Each individual case may be one, a combination, or none of the above. Genetic predisposition may result from a varied single gene or a combination. Learn more about mental disorders. Read some of our recommended books like Surviving Schizophrenia: A Family Manual by Dr. E. Fuller Torrey and Overcoming Depression by Dr. Demitris Papolos and J. Papolos. It may be therapeutic to you to help others if you cannot help your family member. Recognizing that a person has limited capabilities should not mean that you expect nothing of them. Don’t be afraid to ask your family member if he is thinking about hurting himself. A suicide rate of 10% is based on it happening to real people. Your own relative could be one. Discuss it to avoid it. Mental disorders affect more than the afflicted. Your conflicted relationship may spill over into your relationships with others. You may unconsciously reenact the conflicted relationship. It is natural to experience a cauldron of emotions such as grief, guilt, fear, anger, sadness, hurt, confusion, etc. You, not the ill member, are responsible for your own feelings. Eventually you may see the silver lining in the storm clouds: increased awareness, sensitivity, receptivity, compassion, maturity and become less judgmental, self-centered. Allow family members to maintain denial of the illness if they need it. Seek out others whom you can talk to. You are not alone. Sharing your thoughts and feelings with others in a support group is helpful and enlightening for many. The mental disorder of a family member is an emotional trauma for you. You pay a price if you do not receive support and help. Support the National Alliance on Research for Schizophrenia and Depression (Narsad.org) and the search for a cure!